Have You Been Hurt In A Public Parking Lot Accident In New York Or On Long Island? Injuries occur in public parking lots quite frequently. It’s no surprise that when pedestrians and vehicles are in a relatively small space, often distracted by their surroundings, accidents often happen. A 10-year study showed 13 percent of all parking lot events included pedestrian fatalities. So the question is: how do you know who is responsible for parking lot accident? Parking Lot accident – Who’s At Fault? Parking lot owners are usually responsible. Most of time, the owner of the parking lot is the responsible party in the event of a parking lot accident, assuming the lot owner was negligent. Parking lot owners are responsible for ensuring their parking lots meet safety standards. Additionally, they are responsible for making regular inspections and repairing any dangerous conditions that could cause harm. 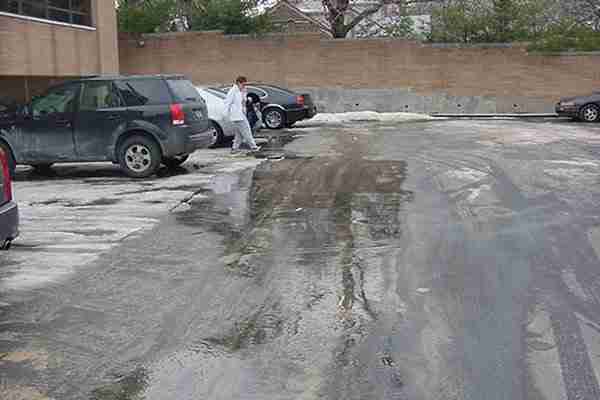 The law does acknowledge that parking lots are exposed to the elements, and it’s impossible to ensure every single harmful condition is constantly taken care of. In order for the owner to be held liable, the injured party must produce evidence the parking lot owner was negligent. Foreseeability: the lot owner’s negligence must cause the injury. Reasonability: the lot owner is only responsible for unreasonable risks and is not required to repair every imperfection. If a pedestrian is hit by a vehicle, “Duty of care” determines who is at fault in a parking lot accident. Both drivers and pedestrians are expected to follow rules and exercise reasonable care in this environment. Courts consider a variety of factors when determining negligence and if a driver is negligent in the operation of his or her vehicle, he or she will be expected to pay damages for property damage and pedestrian injuries. There is a greater “duty of care” for drivers when it comes to children. If it’s expected that children would be present in a parking lot, for instance at a school or childcare center, drivers are legally expected to exercise a higher degree of care. Pedestrians also have a “duty of care” in regard for their own safety. What Should You Do If You Are Injured In A Parking Lot? Obviously, in the minutes following an injury, you are less concerned about negligence and the law than you are about your injuries. You should seek medical attention following any accident, even if your injuries do not appear to be that serious. This ensures the incident and your injuries, regardless how mild they might seem at the time, are documented. What are the most common causes of parking lots injuries? Once you’ve sought medical attention for your injuries, you’ll need to contact a licensed attorney who can help you with your parking lot accident case. There are limits as to how long you have to file a lawsuit, so the sooner you take action the better. There is no reason why you should be responsible for the cost of your medical treatments in an accident that was not your fault and an experienced personal injury attorney can ensure you are treated fairly. Though parking lot owners are responsible for ensuring proper security and lighting, parking lot owners have no duty to protect customers from random crimes. However, if numerous robberies or assaults occur in a poorly lit or poorly secured parking lot, and the lot owner makes no effort to prevent the problem, he or she could be held liable because there is foreseeable risk. Taking safety precautions is especially important in a parking lot. During the winter months when there are weather-related challenges, safety becomes even more of a concern. Parking lot accidents are extremely common. According to CBS News, reporting on information from the National Safety Council, at least 60,000 are injured and 500 or more die in the 50,000 plus crashes that occur in parking lots and garages every year. What can you do to ensure your safety as a pedestrian when dealing with winter weather in parking lots? One of the main causes of slip and fall accidents in parking lots is ice and snow. Add to that risk poor lighting, the attention you must pay to vehicles in the area, and your own unique need — this is a recipe for disaster. You might be able to run to the store in flip-flops or sandals when the weather is nice, but in the winter you need flat-soled snow boots or shoes with good tread. You never know when a random puddle could freeze over and cause a slick spot. Your complete focus should be on walking and what’s going on around you, so put away your phone and watch where you’re going. Make sure to be defensive when it comes to vehicles in the area. Try to make eye contact with drivers before crossing in front of their vehicles. If you have any suspicion a driver hasn’t noticed you, stop walking until they come to a full stop. Be sure you move carefully behind vehicles that might be backing out of parking spaces. Keep in mind vehicles might not be completely cleared of snow before being driven, which means drivers have more blind spots than usual. What can you do to ensure your safety as a driver when dealing with winter weather in parking lots? Walking isn’t the only time you’re at risk in a parking lot. It’s also important to drive carefully when you’re surrounded by other vehicles and pedestrians. Most of the time, parking lot owners make an effort to promote a safe environment – considering they are legally responsible. Make sure you follow the posted speed limit signs and lane designations. As tempting as it might be to cut across empty parking lanes, avoid doing so. This is even more important during the winter months when snow banks from a plowed lot reduce visibility. Make sure your focus is on driving. Clear your vehicle of snow and ice and adjust your mirrors before pulling out of a parking space. The better you’re able to see the less risk there is for an accident. Nothing makes a parking lot completely risk free, but following these tips during the winter months will make you safer. You have a right to be compensated for your injuries, lost earnings, and pain and suffering damages. We will ensure your rights are protected as your New York parking lot accident lawyer. Our goal is to make sure you receive the compensation you deserve quickly. Contact The Law Offices of Elan Wurtzel today to get started with a free consultation!